I have an amazing mother. I have so much love and respect for my mom. She is my best friend, my mentor, without her, I wouldn't be here and I wouldn't be the woman and mother I am today. She has supported me through everything, and I get my strength from her. What I have learned from her, I apply to my life everyday. I just hope I can be a good mother the way she has been for me. I have 2 children that are blossoming beautifully with each passing moment. I served 4 years in the US Army, and its funny, I like to tell this story all the time about how even my children are soldiers. Before I was deployed to Afghanistan, I was pregnant and didn't find out until I was 4 weeks into the deployment. I thought i was late because of the stress from deploying, or all those shots and vaccines they gave me, I thought my morning sickness was from the Malaria Pills combined with the excruciating heat, but I knew something wasn't right. I found out I was pregnant and I was sent back home to New York. She is my lil soldier. She is so independent and strong, just like all the women in my family. I love her so much. 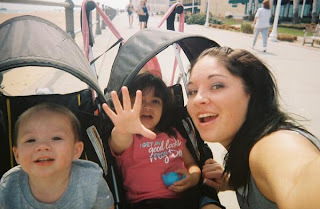 I gave birth to her and was then sent to Iraq only 4 months after she was born. It was so hard to leave her but I had to. We, as mothers, have to sacrifice ourselves and our dreams and our goals to help support our loved ones and children. I had pictures of her everywhere posted in my trail or in Iraq. When I came home for Christmas for R&R after 7 months of being deployed, she barely recognized me and it almost broke my heart. I was afraid the bond was broken. But after an hour, she remembered me. I remember laying with her and stroking her face and hair, threes just no other feeling that can top that. During my 2 week stay, I ended up becoming pregnant again, but of course like my first pregnancy, I didn't find out until I went back to Iraq. I learned I was pregnant, I didn't even realize I was late. There's so much stress being in the Army and being deployed, I thought that's what it was. I didn't get sent home right away, so I was there a good month after learning I was Pregnant waiting to go home. I had to stay because of the first Iraqi Elections were taking place and no one was flying anywhere. So, my son was with me then too. It was after my experiences being deployed that I decided to get out of the service so that I could be there for my children. But I like to joke around that not only am I a combat war veteran, but so are my children. I cant wait for my children to be a lil bit older so I can share that with them. They are still very young. I am not with them right now, they are with their father- and we get along great, I'm just taking care of somethings, but I haven't seen them in almost 2 years. So, this mother's day was a lil hard for me. I spent alot of time away from them and it's hard. I get scared that they will forget me, but I know when the time comes to see them again, all those doubts will be gone. That future moment stays in my mind, helps to motivate me to live right and do what I can to get back to them. For those mothers who cant be there for their children for whatever reason....just remember you are their mother, no one can replace you and no matter what the distance or amount of time you spend away, they will always remember you. Love conquers all. So, that's a lil bit about my story and just wanted to share this with you all. Happy Mother's Day to everyone!